Laphroaig (pronounced la-froyg) is one of the most famous distilleries in the world. Located on the western island of Islay, the distillery was founded in 1815 and has been the best selling smoky malt worldwide for the last six years. Laphroaig is currently owned by Beam Global, who are one of the world's largest spirits companies, and it is running at full capacity (around 2.5 million litres a year) in order to meet the current demand for smoky single malt whisky. Laphroaig is one of the peatest smoky whiskies in the world and this is produced by drying the malted barley over a peat fuelled fire for a longer period than at most distilleries - 18 hours. Over this time much of the acrid smoke gets absorbed into the barley grains and this gets carried through the whole distillation process. Prince Charles issued his Royal Warrant to Laphroaig in 1993, as it was one of his favourite whiskies. This means that they can display the Prince of Wales' crest on their iconic green bottles and white labels. The core range from the distillery consists of two 10 year olds (one of which is cask strength), a 15 years old, a 25 years old and a quarter cask (which is matured in smaller casks). Other limited bottlings are released occasionally but are normally pricy. Laphroaig is popular with independent bottling companies and this one is released by the Glasgow based firm Douglas Laing & Co. 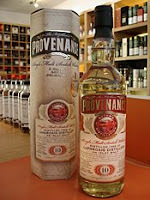 It forms part of their 'Provenance' range and is from a single cask. A bottle should cost about £50 from specialist whisky retailers. The colour is light and and the nose is pungent and full of character. There is an immediate hit of fresh green fruit (imagine apples and pears) that is mixed with a lovely sweet cereal note (think of a digestive biscuit or porridge oats) and powerful peaty smokiness (think of a cross between burning ash and fresh tarmac). On the palate, there is instantly some sugary sweetness (think of honey), followed by that ashy smokiness from the nose. It has a lovely rich feel with the potent peatiness being balanced with soft vanilla. The sweetness is balanced with some bitterness in the form of some cereal grain notes (imagine biting on the bitter husks), a hint of something herbal (think of damp moss) and iodine (a classic Laphroaig characteristic that reminds some people of disinfectant). The finish is long, robust and very enjoyable with the herbal mossy note complimenting the ashy smokiness very well. It burns away in your mouth for ages. This is an excellent dram and one of the best by an independent bottler that I have tried to date.